One of the traits that makes All About Kids such a compelling childcare and learning center is we put play at the center of everything our children do. Utilizing play in this way allows us to create the ideal environment for kids to develop their social, emotional, cognitive and physical skills. Another important part of the All About Kids philosophy is our commitment to the environment. 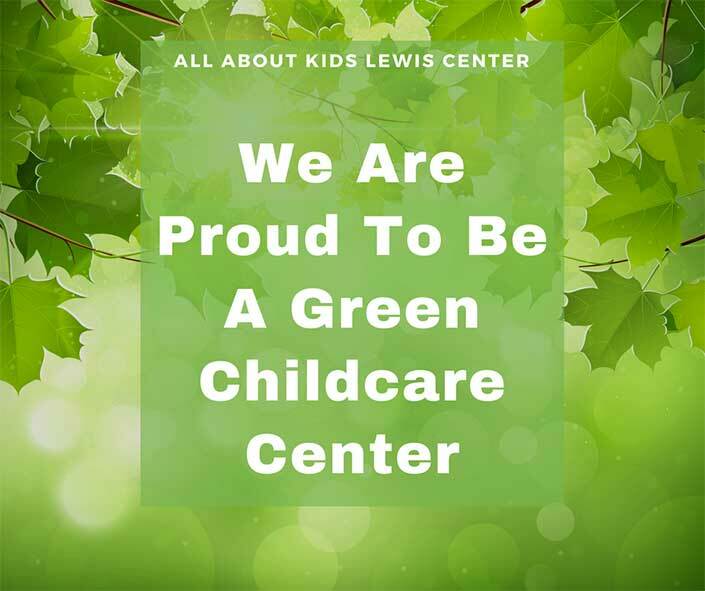 Specifically, we are one of the only green childcare centers in all of the United States. Lewis Center has the distinction of being the first All About Kids location in the Columbus area. Built from the ground up in 2015, our new building offers a location that’s beautiful, clean and convenient. The center was built according to Leadership in Energy & Environmental Design standards. Following those standards allows our building to be LEED-certified. Some of the elements of the LEED for new construction registered project checklist include site selection, water efficiency, minimum energy performance, storage & collection of recyclables, indoor environmental quality and controllability of systems. One of the great things about building our childcare and learning center from the ground up is we were able to optimize every detail, including those related to being green. Our facility has indoor and outdoor areas that are separated by age groups. This allows us to design specific activities that are perfect for supporting the development of each age group. Inside our building, one of the many great features is our ductless rooms. This reduces bacteria and viruses, as well as keeps germs restricted. What this means for all our parents is healthier children! As the worldwide population continues to grow, the challenges faced by the environment will as well. Since today’s children will be impacted by these challenges, we believe in providing education around how to become stewards of our earth. Activities like nature education and gardening enable our staff to teach helpful lessons about the environment. Another way that we engage kids in this type of learning is by talking about recycling and having them get involved in this activity. If you want to learn more about enrolling in All About Kids, we encourage you to call us at 614-505-3399 or schedule a tour of our Lewis Center facility.